Aero Classics Models: one limited edition collectable, die-cast metal models of RETRO (1950s – 1970s) Ground Support Equipment. This is a set of 15 individual pieces in a 1/400 scale. May be used with most Airport Terminal Diorama Displays in a 1/400 scale. Each set includes GSE’s such as; a tow truck, tow bar, fuel tanker truck, belt loaders, staircase, power generator, a service truck, plus baggage dollies with tractor, all in the Air Canada Airlines Old 1960s Scheme & Logos. These models are constructed of die-cast metal with some plastic parts. Not suitable for children under (8) eight. This product is available beginning in April 2018. Aero Classics Models: one limited edition collectable, die-cast metal models of RETRO (1950s – 1970s) Ground Support Equipment. This is a set of 23 individual pieces in a 1/400 scale. 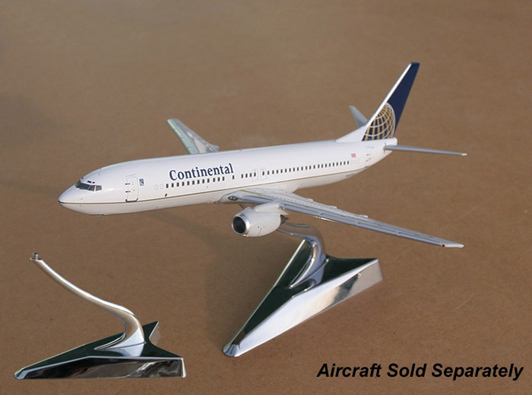 May be used with most Airport Terminal Diorama Displays in either 1/400 or 1/500 scales. Each set includes GSE’s such as; a tow truck, fuel tanker truck, belt loaders, staircase, buses, power generator, motorized staircase, a service truck, plus baggage dollies with a tractor and more, all in a Generic Light Grey & White Colors Scheme. These models are constructed of die-cast metal with some plastic parts. Not suitable for children under (8) eight. This product is available beginning in April 2018. Aero Classics Models: one limited edition collectable, die-cast metal models of RETRO (1950s – 1970s) Ground Support Equipment. This is a set of 15 individual pieces in a 1/400 scale. 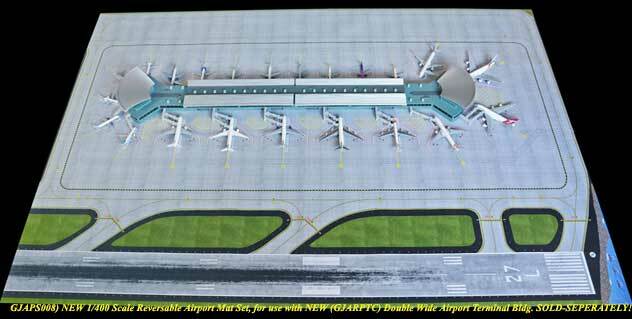 May be used with most Airport Terminal Diorama Displays in a 1/400 scale. Each set includes GSE’s such as; a tow truck, tow bar, fuel tanker truck, belt loaders, staircase, power generator, a service truck, plus baggage dollies with tractor, all in the Trans Canada Airlines Old 1960s Scheme & Logos. These models are constructed of die-cast metal with some plastic parts. Not suitable for children under (8) eight. This product is available beginning in April 2018. 1/400 Scale RETRO Trans Canada Airlines Set of GSE's. Aero Classics Models: one limited edition collectable, die-cast metal models of RETRO (1950s – 1970s) Ground Support Equipment. This is a set of 15 individual pieces in a 1/400 scale. 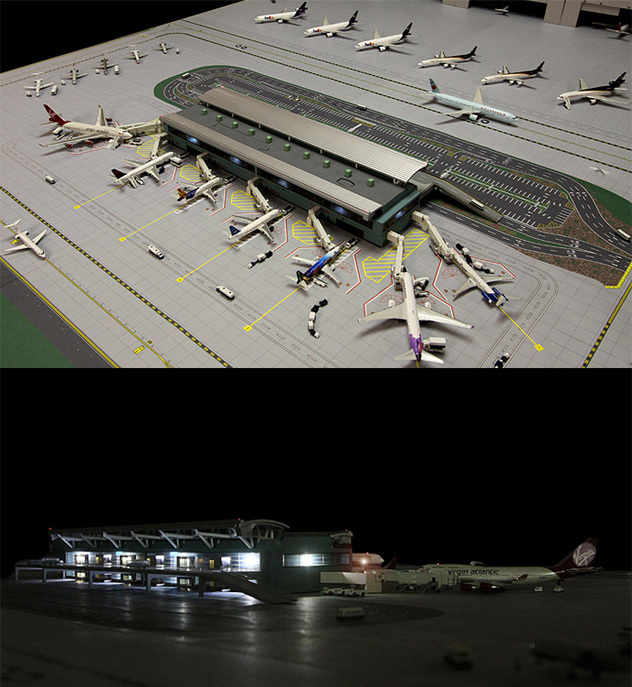 May be used with most Airport Terminal Diorama Displays in a 1/400 scale. Each set includes GSE’s such as; a tow truck, tow bar, fuel tanker truck, belt loaders, staircase, power generator, a service truck, plus baggage dollies with tractor, all in the CP Air Airlines Old 1970s Scheme & Logos. These models are constructed of die-cast metal with some plastic parts. Not suitable for children under (8) eight. This product is available beginning in April 2018. Gemini200 Accessory: one limited edition LARGE Metal and Wood Model Stand for use ONLY with 1/200 Scale Models. Applicable for most Gemini200 wide-body aircraft Models. 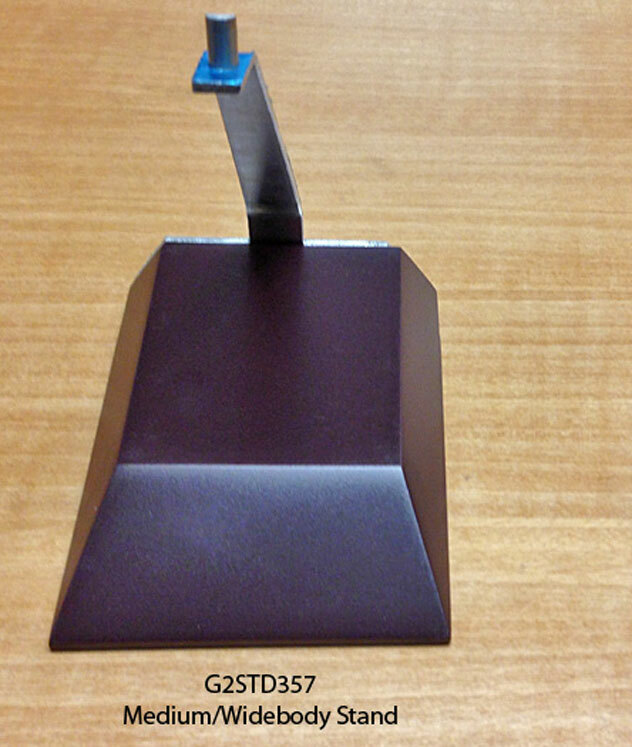 A Brushed Metal Stand finish with a stained wood Base. NOTE: Some minor assembly is required. This product is constructed of metal with some wood parts. This product is available beginning in July, 2015. Please note, this Large unit should only be used with WIDE-Body 1/200 scale models, such as the Boeing B747's, B777s and the Airbus A380's. This product uses two screws for assembly, which is required. Once opened, this product is "NOT REFUNDABLE. Gemini Jets Accessory: one limited edition set of 1/200 scale Airport GSE’s vehicles, an Airport Accessories Play of set of 5 Pieces of GSE’s (Ground Support Equipment). All in the American Airlines Current Colors & Logos. 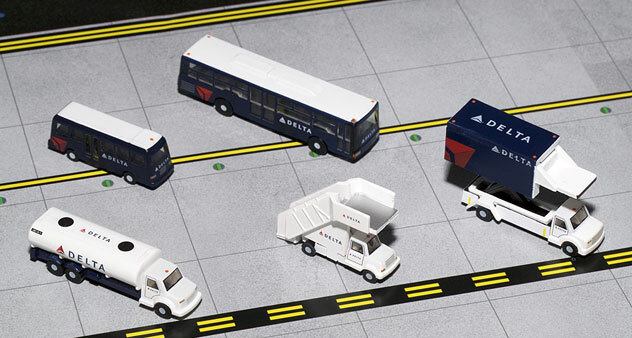 This set can be use individually or with all types of 1/200 scale Airport Diorama Displays. Each set consists of multiple types of modern GSE’s., a gasoline tanker, buses, Service truck and Stairs. Each product in this set is constructed of molded plastic with some metal parts. This product is available beginning in March, 2018. Gemini Jets Accessory: one limited edition set of 1/200 scale Airport GSE’s vehicles, an Airport Accessories Play of set of 5 Pieces of GSE’s (Ground Support Equipment). All in the Delta Airlines Current Colors & Logos. 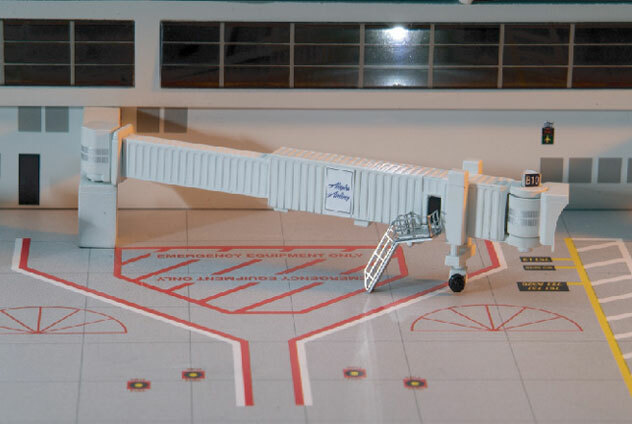 This set can be use individually or with all types of 1/200 scale Airport Diorama Displays. Each set consists of multiple types of modern GSE’s., a gasoline tanker, buses, Service truck and Stairs. Each product in this set is constructed of molded plastic with some metal parts. This product is available beginning in March, 2018. Gemini250: a 1/250th scale, die-cast metal CHROME STAND for use with all NEW GEMINI Jets 1/250th Scale Models featuring retractable landing gears. This item is available as of March, 2005. Please Note, this unit uses a screw in assembly. It?s NOT REFUNDABLE! And is NO LONGER in PRODUCTION. Available while supplies last. Gemini250: a 1/250th scale, die-cast metal CHROME STAND for use with all NEW GEMINI Jets 1/250th Scale Models featuring retractable landing gears. Gemini200 Accessory: one limited edition MEDIUM Metal and Wood Model Stand for use ONLY with Gemini200 1/200 Scale Models. Applicable for all Gemini200 wide-body. Models. 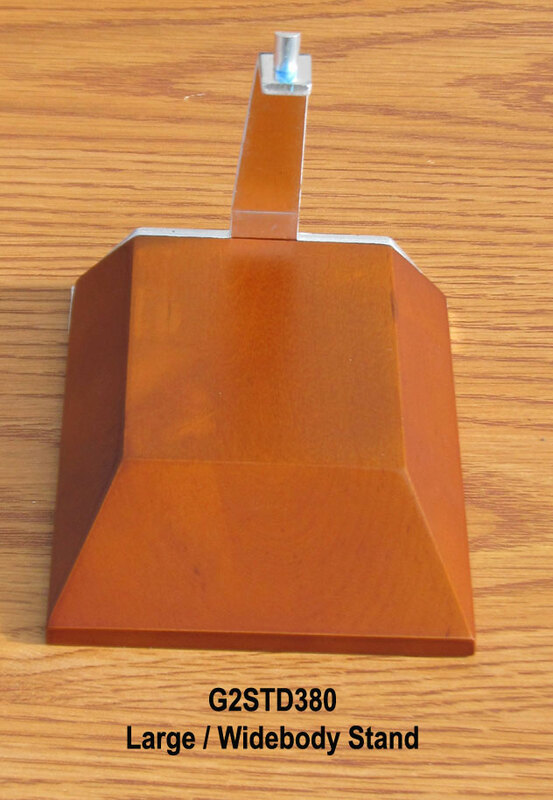 With a Brushed Metal Stand finish and a Stained wood Base. NOTE: Some minor assembly is required. This product is constructed of metal with some wood parts. This product is available beginning in June, 2013. Gemini200 Accessory: one limited edition SMALL Metal and Wood Model Stand for use ONLY with Gemini200 1/200 Scale Models. Applicable for all Gemini200 Narrow-body. 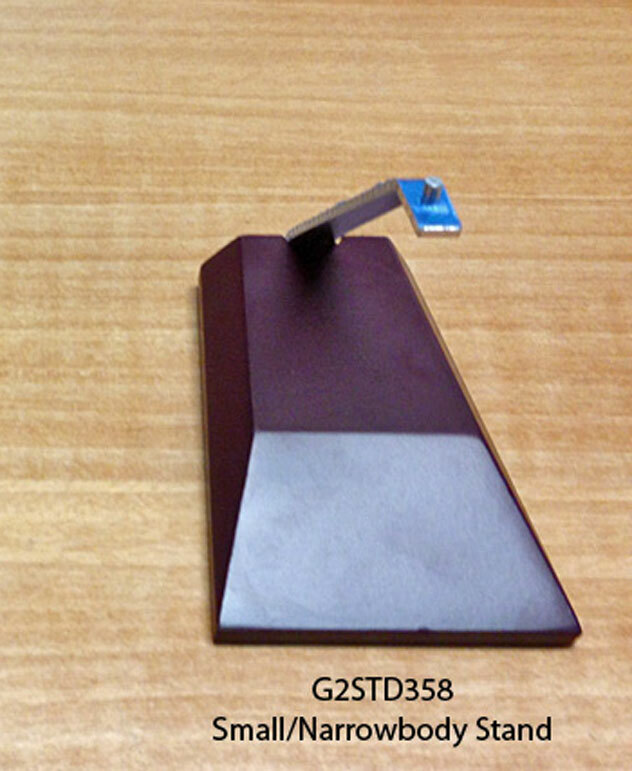 Models with a Brushed Metal Stand finish and a Stained wood Base. NOTE: Some minor assembly is required. This product is constructed of metal with some wood parts. This product is available beginning in June, 2013. 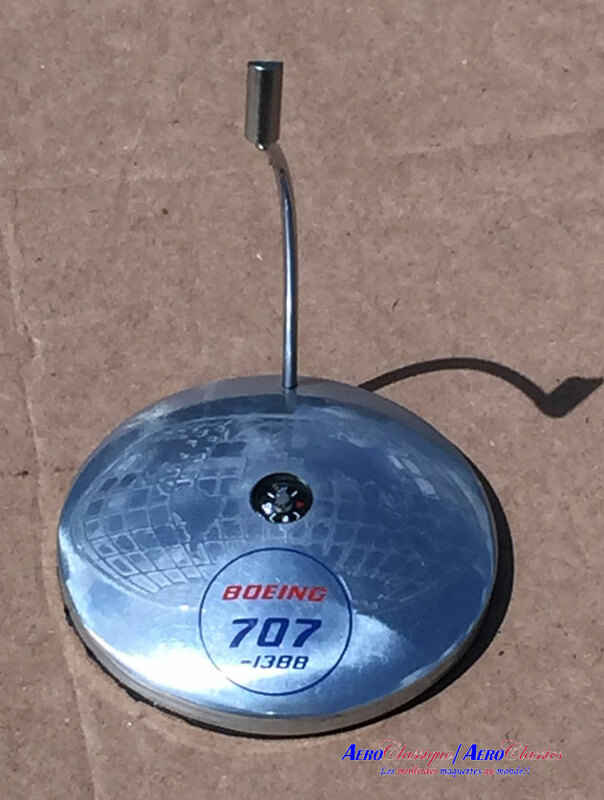 Please note, this Small unit can only be used with most Narrow-Body 1/200 scale models, such as the ERJ's CRJ's Fokker's KC-135's BAC-111's Douglas DC-9-10's & 30's and Bombardier DASH-8's. 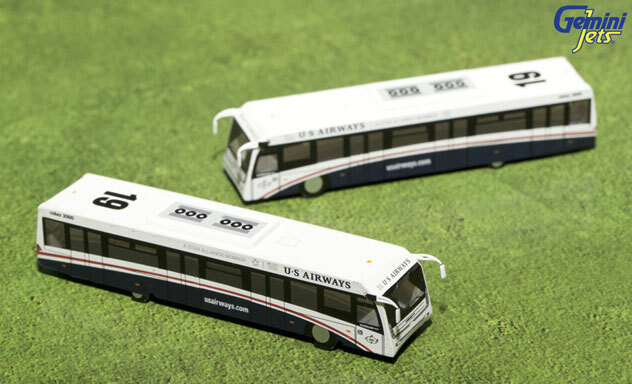 Gemini200 Accessories: one limited edition Set of Airport GSE vehicles, Airport Service Buses Set of two (2) in a 1/200th scale of Corporate or Company Buses in the US Airways Standard Color Scheme. Each sets consist of four (4) each Large Buses. Each product in this set is constructed of molded plastic with some metal parts. This product is available beginning in June 2016.